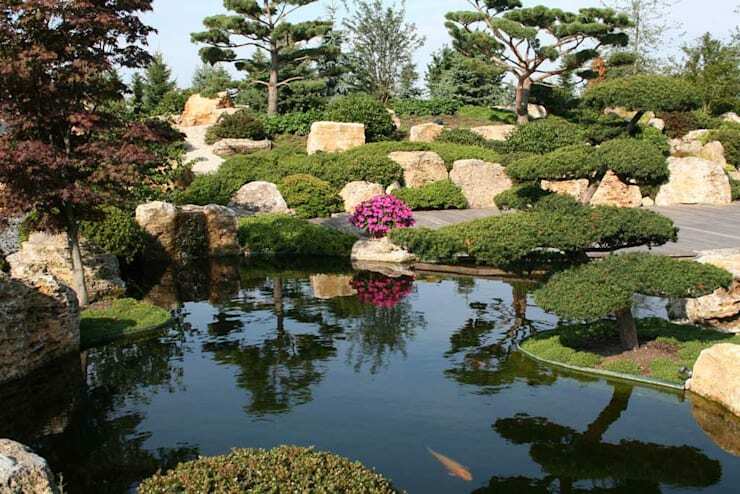 Consider creating a garden pond to be a rare privilege for you. 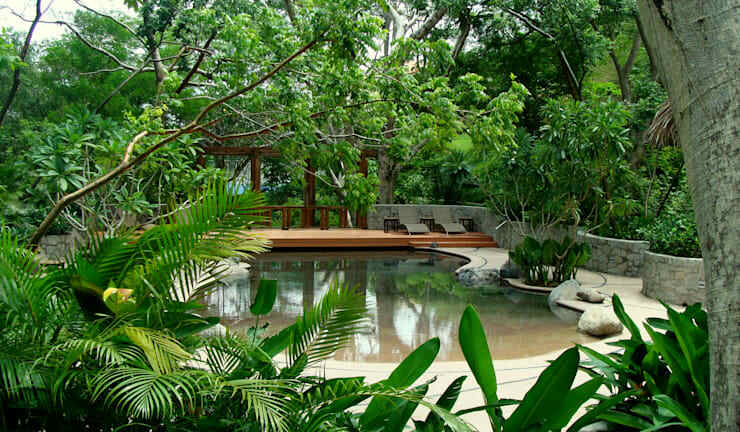 Not only it implies that you still retain a beautiful garden to spend your early morning and late afternoons, it also means that this garden is reasonably large enough to have a pond in it. 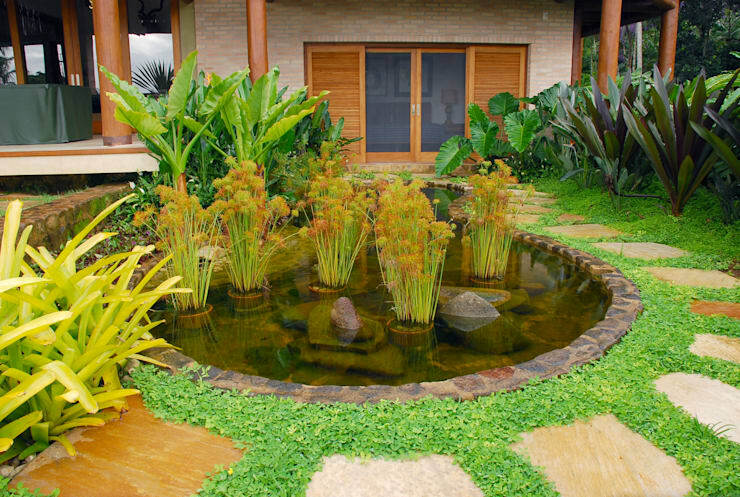 Though garden ponds can be big or small depending on the purpose for which it is planned. If you planning a koi pond or simple water garden you can remain satisfied with a smaller size. More elaborate lotus ponds would need greater amount of space. Claude Monet’s water lily pond has served as a model for many of his paintings and is now part of a myth. Another leading artist of 19th century Max Liebermann, once managed to acquire a beautiful piece of land in Wannsee, close to Berlin city centre. He painstakingly built a charming garden with a water lily pond in it part of which have reinstated for modern nature lovers and art aficionados. Surely, many of you still have the same kind of reverence for nature’s beautiful face and would not be hesitant to spare a weekend or two in beautifying your backyard. So for your benefit I will share some tips for creating a charming garden pond. If possible, involve your family members and close friends in the project and have a fun time together. Unless built keeping any specific purpose in mind, most ponds can be best enjoyed when built closer to home. Choose a spot that can easily invite natural flora and fauna without causing any damage to them or, for that matter, headache for the interior of the house. Biotop Landschaftsgestaltung GMBH built this charming little pond almost adjacent to the building. Ponds built close to portable electric generators, outer units of the air conditioner etc can steer away birds and butterflies instead of inviting them. Choose a spot that gets direct sunlight at least one third of the time. You will have to build good drainage to prevent rain water running into it or pond water becoming stagnant. Wildlife ponds can afford to be shallow. About 2 ft depth should be enough for them. But one that doubles up as an outdoor entertainment zone and aquatic garden need to be bigger in size. Once you choose a spot start digging it into the desired shape and depth. Create a gentle slope. Install the pond skimmer. Remove any sharp stone from the site of excavation. Add a liner. Use underlay or any old carpet to do so. Ensure the liner is clean and is evenly laid out. Join two liners with double sided tape or naptha. Pleat the liner along the rim to a nice shape. Remember, to have extra underlay in case you wish to build a pond waterfall or stream. Create about 6 to 8 inches deep channel and use bricks or stones to line the edges. Make it level with the ground. Line it with plastic liner. Install a reservoir and place a pump in it. Push the pipe outlet along the channel and install an external pond filter at the other end to prevent any blockages. Cover the channel with gravel and sand. Place copingstone around the edges. Keep them slightly above the water level. If these are of sufficiently large size they would remain stable without any use of mortar. But if stone sizes are small or you foresee people frequently walking along the edges, mortar the stones in place. You may use expendable foam as well. Beautify the edges further with thin stones, cobble and gravel. 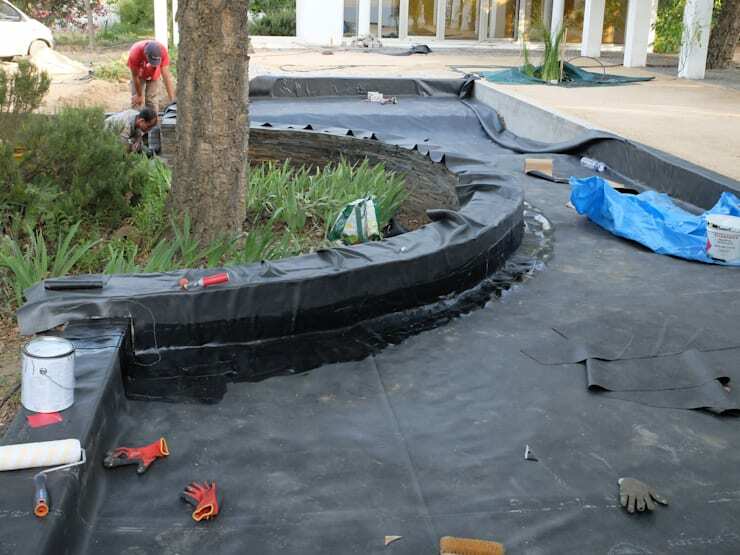 Red or pink granite, pea gravel, plum slate, oyster pearl pebbles or tweed pebbles can be used to adorn the rims of the pond. Variation in size and colour will bring out the best results. You can wait for rain to fill in the void or collect freshwater from natural streams close by. Avoid using tap water as it comes rich with various minerals and is treated for drinking. Add dechlorinator to remove any traces of chlorine. 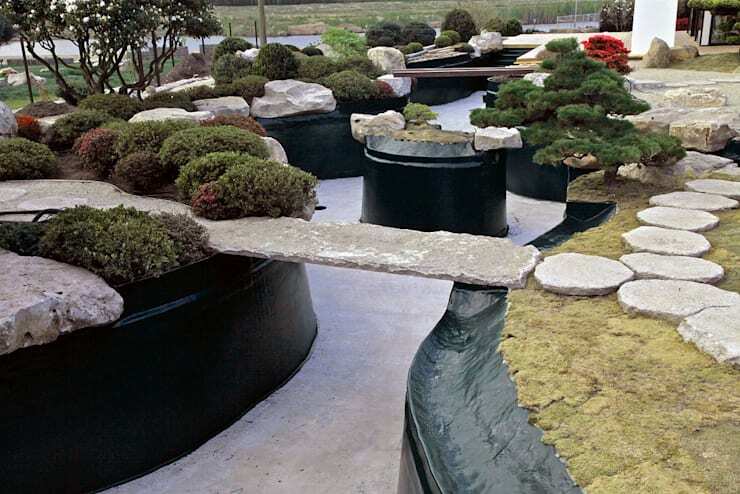 Once in place you will also require to look after your pond. Using aquatic plants will solve any persistent algae problem. Blanketweeds can be removed by using biological filters. If you are only using this as a fish pond you will need to partially change the water every 3 to 5 weeks. Remove weeds and thin out the over aggressive plants. From time to time, check for any leakages in the liner. Water moss, mentha, hornwort, bacopa, clover and anacharis are particularly suited for garden ponds. They keep the water oxyginated and free of certain weeds. 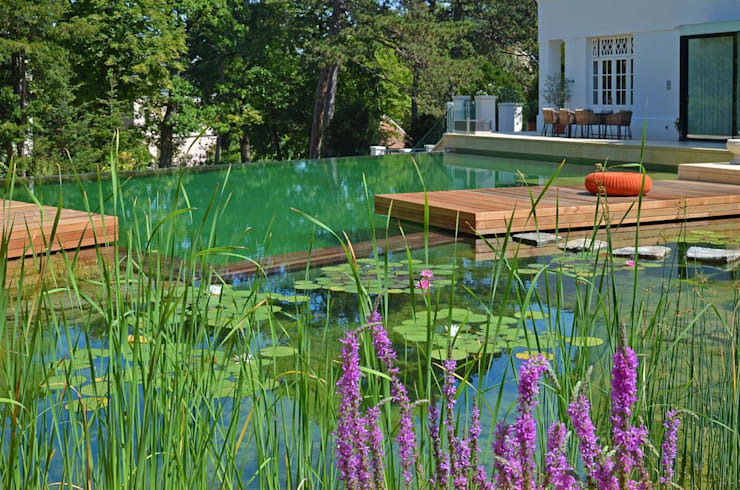 Water lilies are most popular and help to create a strikingly beautiful pond. They are available in great varieties. Marsh marigold, water hawthorne, mosaic plant, Japanese iris etc are best for fish ponds. You can have gold fish and shubunkins. Koi will require a slightly bigger habitat. Don’t ignore lacing up your pond with beautiful flowers and aromatic herbs. Vibrantly colourful calla lilies, kneiffii, filipendula, golden wax bells, lythrum, myosotis and ferns can create a surreal space in the corner of your garden where the pond is located. In time you will also have other guests like birds, amphibians, dragonflies, moths and butterflies in this spirited place of yours. Check on this article to find out about the furniture that you can use on the sundeck nearby.